Pandemic flu isn't front page news yet, but Scottsdale Healthcare is already planning its second disaster drill to help prepare for a crisis outbreak of bird flu. On April 25, hundreds of simulated patients with bird flu symptoms are expected at Scottsdale Healthcare Osborn and Scottsdale Healthcare Shea as part of the second annual Coyote Crisis Campaign. Both hospitals will simulate triaging flu patients, screening employees and physicians entering the hospitals, and enacting access control points. Hospital visitors that day may also be asked to pass through simulated flu screenings and receive educational material on flu. Humans will have little or no natural immunity to Avian flu, commonly referred to as H5N1 or bird flu, when it eventually spreads to North America, according to public health experts. A flu disaster drill held last fall activated emergency operations centers to manage and conduct mass immunizations of hospital employees at Scottsdale Healthcare Osborn and Scottsdale Healthcare Shea. April's drill is part of the Coyote Crisis Campaign, a regional disaster response exercise testing readiness and collaboration among hospitals, business, academic institutions, military and government, including health agencies at the county, state and federal levels. "This exercise will help determine how participants would deal with a pandemic flu, and how they would interact with others in the community to help get through such an unprecedented public health emergency," says Nancy Hicks-Arsenault, RN, director of emergency services at Scottsdale Healthcare. Participants in this year's Coyote event include Scottsdale Healthcare, the Air National Guard, General Dynamics, Luke Air Force Base, the City of Scottsdale, Arizona State University, Maricopa Integrated Health System, Scottsdale Insurance Company, the Arizona Republic, Mayo Clinic, the Arizona Department of Health Services, Maricopa County Department of Emergency Management and Maricopa County Department of Public Health. The concept of local disaster response planning was successfully tested during the inaugural Coyote Crisis Campaign in April 2006, which simulated a terrorist attack in Scottsdale. The 2007 Coyote Crisis Campaign is planned for the week of April 23-27. Observers from the military, state and county government, as well as officials from Washington, DC attended the 2006 exercise and noted it set the national benchmark for local disaster response. KUWAIT CITY, March 10 (UPI) -- Tests for avian influenza on more than 300 people in Kuwait have so far come back negative. Officials told the KUNA news agency Saturday that the results of 280 of the 308 samples taken were back and had proven negative. At the same time, no new cases of bird flu had been reported. Kuwaiti officials had fanned out across the emirate after the bird flu cropped up to conduct testing and disinfect farm areas in Wafra, Al-Abdali, Al-Sulaibia and Kabad. As a precaution, KUNA said, hawk hunters were asked to stay out of the field for a while since migratory birds are believed to be carriers of the potentially disastrous avian virus. 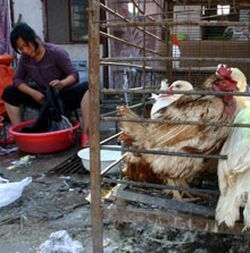 In 2003 and 2004, South Korea destroyed more than 5 million poultry to curb the spread of the disease. No South Korean has yet to be infected. If the man tests positive, it would be the country’s second case of a human being infected with the disease. Four quarantine workers were treated for infection in 2003 after participating in a culling operation in South Chungchong Province during a bird flu outbreak at chicken farms there. Although they tested positive, the four men did not show any flu-like symptoms. "Specialists believe the virus was introduced by wild birds migrating from east Africa to west Asia as no outbreaks of the disease had been reported in the source areas of the poultry," Xinhua said.